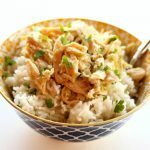 Instant Pot Salsa Verde Chicken is the perfect recipe to have in your back pocket on those days when you don’t have the time or energy to cook. With just 2 ingredients this recipe is quick and easy. It tastes great and can be served in many ways including over rice, in tacos, burritos or quesadillas or on top of salad. Place chicken in the Instant Pot. Pour the salsa verde and water over the top. Cover the pot and secure the lid. Make sure valve is set to sealing. Set the manual/pressure cook button to 12 minutes (thawed chicken) or 15 minutes (frozen chicken) on high pressure. When the time is up let the pot sit for 5 minutes (display will read L0:05) and then move the valve to venting. Remove the lid. Use tongs to move the chicken to a cutting board. Shred* the chicken. Then stir it back into the Instant Pot. Use chicken in tacos, burritos, quesadillas, over rice, in salad or plain.